Often, people hang tools sharp side out. Hang sharp side towards the wall to prevent personal injury to family members. So many tools, so little space. Even in the biggest garages, tools and gardening equipment often start to take over. And why does that rake always seem to threaten to fall on you every time you open the car door? Start by sorting your tools into groups. Put all the gardening equipment together in one area of the garage. 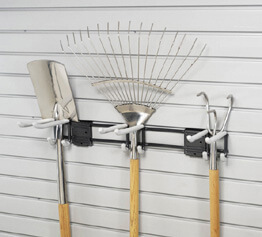 Hang rakes and shovels on lockable hooks with the sharp side towards the wall. That way you’ll know they’re secure. Don’t hang tools on nails hammered into boards – it’s an accident waiting to happen. A slatwall system is a great solution because hooks and baskets can be safely locked into place. Electric tools, such as lawnmowers and weed whackers can also be hung on locking hooks with their extension cords wrapped and stored neatly on hooks beside them. Smaller tools with holes in the handle are easily stored on hooks. That way you’ll always be able to find what you need when you need it. Tools for woodworking or home maintenance, such as drills and saws, can also be neatly stored in the garage. Any tool with a handle can be hung safely and securely and easy to find. Smaller items (especially tools for a car enthusiast) should be stored in a cabinet with shallow drawers. Place the tools in one layer so you can see them easily. Line the bottom of the drawer with a rubber membrane mat to prevent the tools from sliding around. Next time we’ll discuss making room for a workbench in the garage, so you can store and use your tools in one place. In the meantime, give us a call. We’ll help you find a solution to all your garage storage needs.